It is no secret that Norwegians love to ski or that in Italy, pasta is almost like a religion. But I wanted to know what people love doing in other countries. I tried to pick passions and countries that were relatively unknown to me. I hope you will learn as much as I did. On the coastline of Peru, sur ng is a must. At Chicama beach there are the longest waves in the world. Sur ng in Peru dates back to ancient time when Chimumen went shing riding small pointed boats. Although sur ng was considered an elite sport, it has now spread to all social classes. Sur ng even has its own program on Peruvian television: SurfPeru. Karaoke was invented in Japan in the seventies. It is very popular among both locals and tourists as it is not too expensive. It is common to spend the night in a karaoke bar until 3 am. where you go to a private room called karaoke box. There you can order food and drinks via telephone. It is also possible to go to karaoke bars where you sing in front of everyone. The japanese likes to go to karaoke with friends, family, with colleagues after work or even alone. In Australia, walking barefoot comes from Aboriginal culture, but many non-aboriginal people also walk without shoes. Of course, not everybody walks barefoot, but during summer, it is normal to do so. I don’t mean only walking barefoot on the beach, but in streets, shops, gas stations, and even school. The streets are clean and people are not seen as dirty or poor. Instead, Australians consider walking without shoes as letting your feet breath and it gives them a sense of freedom. Wife carrying is originated in Finland, but it is extremely popular in Estonia. This sport consists of a race where a male participant carries a female partner (couples don’t have to be married) on a track with di erent obstacles like sand, water and fences. Participants can carry the “wife” in several ways. The most popular one is the Estonian style with the woman hanging upside down with her legs around the man’s shoulders, holding his waist. 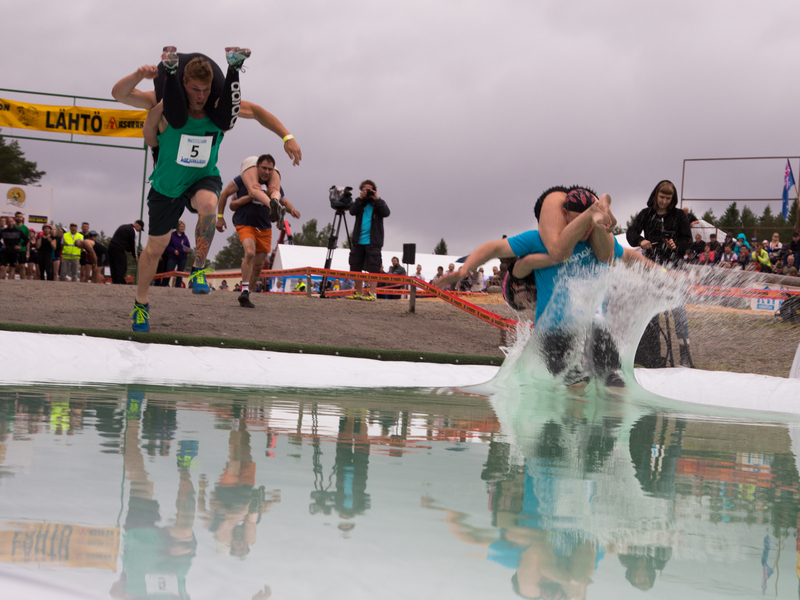 Estonia won the WifeCarrying World Championships held in Finland for eleven consecutive years between 1998 and 2008. Basketball is the most popular sport in the Philippines. It is almost like a religion. It was introduced to the country during the American occupation of the Philippines from 1898 to 1946. The little cost of playing basketball explains the popularity of the sport among the whole population. Filipinos love basketball on both amateur and professional level. All social classes and all generations are playing, as well as watching. Basketball courts are everywhere and the Philippine Basketball Association is the rst professional basketball league in the world outside of the United States. In Jamaica, the British who ruled the country brought the love for dominoes in the late 18th and 19th century. Jamaican people love to play dominoes at home, in bars and in the streets. All social classes play dominoes, though it remains a game mostly played by men. When they play dominoes, Jamaicans get very excited and it is common to see people shout and cheer for their favourite team. In Jamaica, players usually play the partner style where four players are in teams of two. In Jamaica dominoes is a sport and thanks to the National Association of Domino Bodies, the country hosted the 10th Domino World Championship in 2012. I hope you discovered new aspects of different cultures. What about your country or city, what are the things everybody love doing?